My Collected Recipes is now available in version 1.1 and allows adding of photos from the media library. My Collected Recipes is for getting your own collection of recipes into your iOS device by simply taking photos of your recipe notes. Now available: a dice rolling app specifically for the Apple Watch featuring configurable dice sets of multiple polyhedral dice. Just roll 3d6+1 with one touch, for example. Adapted Ape Test and Ape Test Lite for the larger displays of iPhone 6 and iPhone 6 plus. Found the bug thanks to the feedback of a user. Many thanks for that! The bug affects the iPad version of Ape Test only and prevents the numbers from appearing. The fixed version 4.1 should be available soon. Seems like some people have problems with version 4.0 of Ape Test freezing. I'm sorry about that! To fix that bug, please contact me at support@portableinnovations.de because I need more details. To celebrate the imminent 5th birthday of the App Store Ape Test is free today! Create random letters for word games like the Categories game. You now can play Ape Test and Ape Test Lite on the 4 inch display of iPhone 5 without black bars (letterbox). Updates of Ape Test and Ape Test Lite with support for the 4 inch display of iPhone 5 have been submitted and should soon be available (versions 3.3 and 1.5, respectively). Ape Test 3.2 and Ape Test Lite 1.4 fix a bug where the numbers would not appear anymore or tiny white dots would be shown instead of the white squares (iPhone only). Version 3.1 of Ape Test containing the bugfix has just hit the App Store. Many thanks to the great folks at Apple who granted my request for expedite review and did just that: an awesomely quick review! 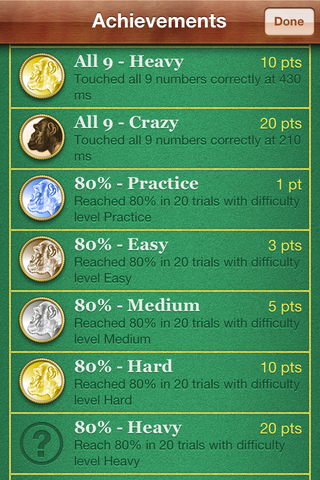 Version 3.0 of Ape Test is available on the App Store since last evening. Unfortunately I did uncover a nasty bug which can cause crashes when displaying the leaderboards or achievements in low memory situations. The bug is already fixed and the version containing the fix (3.1) has been submitted to review with a request for expedite review. Until the fixed version is available, I advise to save your gaming state before opening the leaderboards or achievement views by switching to another app and back to Ape Test (this triggers a save). I apologize for any inconvenience. Some users were confused that no window opened when launching the program and at first thought that the program had failed to start. Because of that I added a starter window which is always shown when no glossary window is open (and only then). This starter window allows to create a new glossary or open an existing one. The update (2.4.1) has been submitted yesterday to Apple and should probably be available within a few days. My new Mac application Glossary is now available on the Mac App Store. An excursion to the Mac: within the next couple of days a new application of mine will be available on the Mac App Store. So, no iOS app this time. It is an application to record definitions of terms in a simplified way. Originally I did write it for my wife who uses it for her studies. For the Mac App Store I did some polishing, added more functionality and online documentation which is available from within the app itself as help. More information on Glossary's website. First of all I'd like to thank you all for the many reviews in all the country stores of iTunes! The additional levels would be problematic in the iPhone/iPod-Version because there would not be sufficient space for that many buttons. They would have to be replaced by a menu, making selecting levels more awkward. Furthermore there would be many statistics to follow. The bigger problem, though, would be with Game Center support for which an update should come soon. In Game Center there will be a leaderboard for the longest run per possible setting. This means 12 different leaderboards already (4 different timing settings times 3 levels). Adding levels 6 and 8 would result in 20 different leaderboards which I personally think would be too many. What do you think? Drop me a mail! 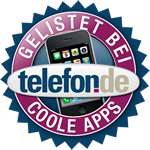 Ape Test is listed in the "Cool Apps" list of telefon.de. Go there and rate it if you'd like Ape Test to become the "App of the Week". Or twitter about it and share it in Facebook. Hot in the App Store! Ape Test is currently on rank 6 in the top charts and on rank 1 in the "What's Hot" section in the category Games/Trivia for iPad in the German App Store! The new versions of Ape Test Lite (1.2) and Ape Test (2.1) are already available on the App Store! The update of Ape Test Lite is especially recommended, because it activates additional game settings, which did not function due to a bug... Yes, those three buttons at the bottom of the screen are there for a reason! the settings buttons at the bottom did not work at all! landscape orientation had been enabled by mistake (and therefore looked very broken until rotated back). It has been disabled again. Furthermore Ape Test Lite now has a shiny new high resolution icon (high resolution graphics remain limited to the full version, though). iPhone/iPod touch: landscape orientation had been enabled by mistake (and therefore looked very broken until rotated back). It has been disabled again. Version 2.0 of Ape Test is now available on the App Store. A big thank you to the reviewers at Apple: that was real fast! Version 2.0 of Ape Test has been submitted to Apple. This version adds specialized support for the iPad. Of course it still runs on your iPhone or iPod Touch and brings some nice improvements to these as well like storing your best values for success rate and average correct touches and a new success sound. It will probably be available on the App Store within a few days. Version 1.2 of Ape Test is now available. This version fixes the bug introduced in version 1.1 which manifested under iOS 4 (see previous news item). Unfortunately version 1.1 of Ape Test contains a bug which occurs under iOS 4: new game results won't be saved when leaving the application. I apologize for this. This bug does not occur under iPhone 3.x. The bug is fixed in version 1.2 which is currently waiting for a review by Apple and should be available within a few days. 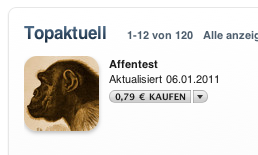 The german magazine iPhoneWelt/MacWelt has reviewed Ape Test and rated it with the grade "2,0" (good). In addition they awarded the logo "iPhoneWelt - Empfehlung" ("iPhoneWelt - Recommendation"). 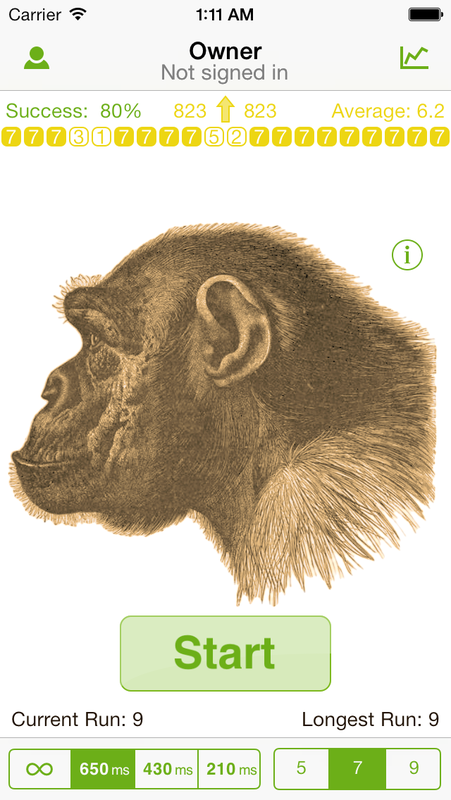 Ape Test is now available in version 1.1 with support for the high resolution Retina display of iPhone 4. The iPad version of Ape Test will be released as an update (as Universal App which contains both the iPhone version and the specialized iPad version) so it won't have to be bought twice. Get a taste of Ape Test!